Toulouse, a new kid in school, is from Canada, and though Woodrow doesn’t like it that his classmates say that he is odd, weird, and little, he does have to admit that Toulouse pretty strange (he wears a three-piece suit and bowler hat to school! He sings like a bird!) and REALLY short (“kindergartener short”). But when Woodrow thinks about it, he realizes that he doesn’t mind at all. After all, Woodrow himself is pretty odd himself–he loves ‘duck’ tape, fly fishing, and is prone to stammering. Woodrow doesn’t see anything wrong with his own behavior, and he thinks that Toulouse is pretty cool. The question is: what will Woodrow do about Garrett and Hubcap, the two class bullies who have switched their attention from him to a new sitting duck, Toulouse? And what IS it about Toulouse?–there’s something about him that Woodrow just can’t figure out. Jennings has written a deceptively slight book that tells a great story, with what I hate to call a ‘lesson’ about bullying, because that makes this book seem prescriptive. It’s not ‘a story about bullying’, so much as it is a story about what it means to be a friend, and who doesn’t like reading about friends? This book is a delightful read for anyone who enjoys school stories. This month, Kelly shares a great new book, Locomotive, by Brian Floca. We swear we made the video before it won all the awards! Sir Isaac Newton gave us 3 of the most important laws of physics which have shaped our understanding of how our world works. Author Mark Weakland and illustrator Gervasio have now given a whole new generation of students an accessible way to understand Newton’s concepts using zombies. Yes, I said: “zombies.” We’ve all heard the apple falling on Newton’s head story and many of us can easily recall the phrase, “For every action, there is an equal and opposite reaction,” but recall does not equal comprehension. Put together a graphic novel with zombies illustrating the principals of gravity, force, and motion, however, and the preverbal light bulbs will be clicking on above even your most struggling students’ heads. Scientific concepts often benefit from the accompaniment of visual examples, and graphic novels provide wonderful vehicles by which to accomplish this union. 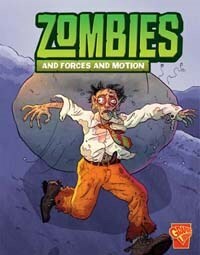 Zombies and Forces and Motion uses humorous illustrations and popular culture to make Newtons’ laws accessible and relatable to students. In addition, one of the goals of the new Common Core State Standards is to build visual literacy skills. By the time students are in junior high, the CCSS require the inclusion of graphic novels in the range of text types, so not only does this book align with the standards for informational texts, but it also provides a great opportunity to begin developing the scaffolding for future visual literacy skills. CCSS.ELA-Literacy.RI.4.7 Interpret information presented visually, orally, or quantitatively (e.g., in charts, graphs, diagrams, time lines, animations, or interactive elements on Web pages) and explain how the information contributes to an understanding of the text in which it appears. CCSS.ELA-Literacy.RI.4.8 Explain how an author uses reasons and evidence to support particular points in a text. CCSS.ELA-Literacy.RST.6-8.4 Determine the meaning of symbols, key terms, and other domain-specific words and phrases as they are used in a specific scientific or technical context relevant to grades 6–8 texts and topics. Siena is not your typical 13-year-old. In fact, her differences are part of the reason that her family is moving from Brooklyn, New York, to a small coastal town in Maine. The other reason is that her three-year-old brother, Lucca, has not spoken in over a year. While Siena and Lucca’s parents are not sure what makes it so hard for Siena to make friends and Lucca to talk, they are hoping the new environment will help them both. Siena is eager to try to start over, but when the family arrives in Maine, the very thing that makes her odd kicks into overdrive. Sometimes, Siena can see the past. Generally, it only happens while she is dreaming, but increasingly she was getting glimpses of the past while awake in things like buildings that are no longer standing in New York or people in out of date clothing. The home the family purchased is right out of one of Siena’s dreams. She is familiar with the layout and can feel what has happened in this house before the family lived there. However, Siena decides this familiarity could be positive and decides to make a go of it in Maine even making some friends before school starts. Lucca loves the beach and the play group his mother found, but he still is not talking. When Siena finds a pen that belonged to one of the previous owners, the story of what happened in the house is reveled, complete with a young girl who also struggles with mutism and Siena begins to wonder if the family’s move really was the best thing for Lucca after all. This title has historical elements as Siena becomes involved in the lives of the family that lived in the house prior to her family, including a brother entrenched in the World War II battle fields. It also blends modern day realism and supernatural elements in a thoughtful and suspenseful manner. Children who enjoy descriptive text, supernatural stories and historical fiction will enjoy this title. “I have a best friend. 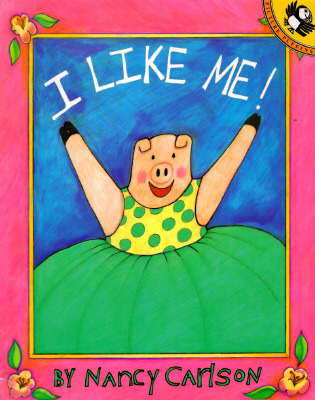 / That best friend is me!” So begins Nancy Carlson’s classic picture book, I Like Me! Everyone can relate to the charmingly illustrated little pig who describes simply and sweetly how she takes care of herself and keeps herself happy, even when she is alone. “When I get up in the morning I say, “Hi, good-looking! / I like my curly tail, my round tummy, and my tiny little feet.” Being okay with your self can be a hard thing for people of all ages to achieve, but this book makes it seem irresistible! 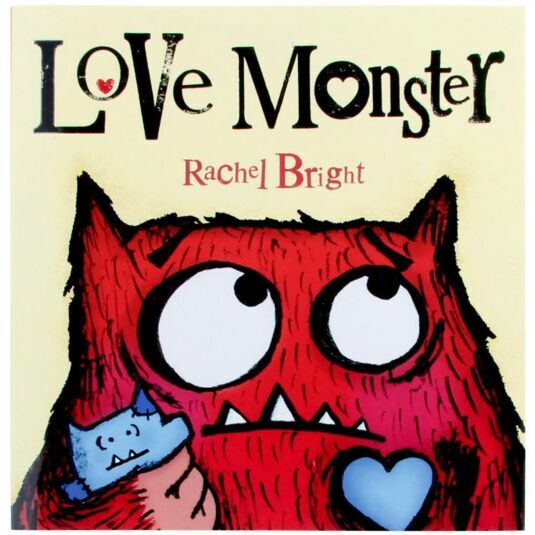 If you’re looking for a book to promote self-acceptance and the worth of each individual, this warm little book makes a great read aloud, one-on-one or with a classroom. With Valentine’s Day right around the corner, I’m on the lookout for books about love. Love Monster was the perfect find. Monster is looking for someone to love. But in a world that is filled with cute, fluffy things it’s a bit difficult for a googly-eyed monster to find. He looks high and low and just when he gives up another monster drives up. The bright, adorable illustrations add to the fun and make Monster hard not to love. When it comes to wordless picture books, I have to admit that I am not a huge fan, but this book is definitely the exception. This story has a sweet little pig-tailed girl who follows a simple line into all kinds of fun! The line wiggles and bends and becomes whatever the girl can imagine. It becomes a slide and a ball and even a bubble. It becomes a monkey and an audience and a monster trying to get the little girl’s cookie! No need to worry though, because the line just becomes a big old bear to scare the monster away. This wonderful book is so full of imagination and fun and will get your imagination going too!